Hydraulic pressure is an excellent option, a smooth, efficient source of power. Not surprisingly, our hydraulic-powered cutters are remarkably light and easy to handle, robust and powerful. The cutter is often used in succession, with a K3600. A unique wall-cutting system, faster and more efficient than using cutting attachments! The Partner K2500 is an easy-to-use, hydraulic power cutter which is also very light. It makes an ideal complement to the K3600, delivering the capacity for demanding jobs which call for high power. 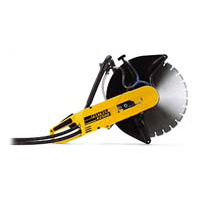 This model offers a large cutting depth for demanding jobs. The K2500 is ideal for heavy concrete cutting, gas/water/sewer maintenance, demolition work, indoor/refurbishment work, prefab factory, and mining maintenance. The Partner K2500 lets you work efficiently and comfortably for long spells at a time. Freedom from exhaust gases and low noise level make it especially suitable for jobs indoors. It is robust, reliable and requires very little service. The hydraulic motor is located inside the main tool casing and drives the cutting disc via a belt. The distance between handles and distribution of weight between handles has been optimised for every normal working position. This makes it easy to guide and operate the cutter with precision and without undue exertion.